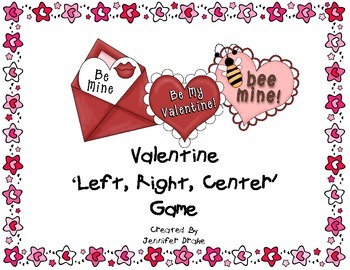 This Valentine's Day, treat your sweet students to a fun and educational game- courtesy of me! This pack includes everything you need to play this fun and educational game- you will just need to provide some prizes and of course super stellar sweet students! *instructions for play, modifications for younger students and ideas for prizes! This game doesn't take much prep and is sure to leave your students 'LOVE'-ing you even more than they already do! I would 'LOVE' to have you stop by my TpT store for all your Valentine and winter resource needs! My store has Valentine foldable readers, syllable, CVC & ABC trains, short & long vowel sorts for centers, color-by-cvc word worksheets, morning work pack & more! If you are having a valentine exchange in your classroom, this is a cute and easy craft for holding all those special valentines! Happy Valentine's Day to you and your students! Happy Valentine Card LRC Fun!